Blowing JTAG Fuse with JTAG SBW? I am using the MSP430F2272 with the TI MSP-FET430UIF Debugger. I would like to blow the JTAG fuse. My JTAG connection from FET to MSP is 4-wire SBW; VDD/TEST/RST/GND. I cannot get either Code Composer (Target->Make Device Secure) or IAR Kickstart (Emulator->Secure - Blow JTAG Fuse) to blow the fuse. Both give me the message: "failed to make device secure". I have read through both slau320b.pdf and slaa149.pdf. It appears that maybe my MSP and/or FET debugger only supports "Fuse Programming via TDI", section 4.1 of slaa149? I hope this not to be the case as we'll have to change our board layout to add more pin breakouts!! Why can't I blow my JTAG fuse with my setup in CCS? Do I have to write my own custom JTAG code, or am I doing something wrong? On 5x devices, teh JTAG fuse is a virtual fuse (a section in BSL flash area). Here you can 'blow' the fuse usign SBW or JTAG or software. However, th e'real' fuse on the 2x and 1x series is blown by electrically buring a diode inside the JTAG circuitry with overvoltage. So yes, you need full JTAG connection to blow the fuse. It cannot be done by SBW. except if you apply such an high voltage to the SBW pins that it will fry the SBW circuitry (and most likely the whole MSP). It's like asking whether you can apply VCC to any other pin, as it is easier to route then. Time to say goodbye - I don't have the time anymore to read and answer forum posts. See my bio for details. Before posting bug reports or ask for help, do at least quick scan over this article. It applies to any kind of problem reporting. On any forum. And/or look here. I'm sorry that I can no longer provide help in the forum or by private conversation. bummer! ok I'll give that a shot tonight (hand wiring on some leads to the MSP's QFN...). Connecting with the full JTAG connection worked just fine. Thanks again! However, the 'real' fuse on the 2x and 1x series is blown by electrically buring a diode inside the JTAG circuitry with overvoltage. So yes, you need full JTAG connection to blow the fuse. It cannot be done by SBW. except if you apply such an high voltage to the SBW pins that it will fry the SBW circuitry (and most likely the whole MSP). This is not strictly true - you just need a little hardware modification when blowing the fuse when using SBW. You add the connection TEST/VPP (for the fuse blowing) to the connection for TEST/SBWTCK, and you must add a 330 Ohm resistor on the TCK line to protect it from the fuse-blowing voltage. This is shown in figure 2-2 below from the Hardware Tools User's Guide, specifically see the resistor R2 and footnote C. This ought not to fry the MSP430 as you are still applying the fuse voltage to the same TEST pin on the target 430 that was designed to take this fuse-blowing voltage, so you just have to add the resistor to protect your programmer TCK line from damage since it's sharing that line. You're right. When talking about SBW, I was thinking of SBW-only FETs such as the LaunchPad FET. Which does not have the TEST/VPP signal at all. However, in a different thread, this 330Ohm resistor has turned out to be the reason for problems with SBW programming. I'm using MSP-GANG PROGRAMMER to program 4 MSP430G2452 by SBW. I selected the option to burn the fuse (secure device check box), but it doesn't work. The programmer indicates a failure, but doesn't give any other informations (no error number or anything). The chip is correctly programmed, but I can read it and rewrite it after the operation. I have the 330Ohm resistor between test pin and TCK pin. Any idea how I could make it work? I am a hardware engineer. don't have much complicate tools like JTAG programmer. I only have a launchpad, and MSP430G2452 is all I want to play with. after I program my code to the chip and verified it works. I want to share my chip with other people, and want to provide some protection to the chip. I am trying to figure out an easiest way to do it. in the attached picture the symbol and table is copied from 2542 datasheet. if I apply 6 to 7V voltage to Test pin, the security fuse will be blown, and the code in the chip will not be accessible any more. will my diagram work? if it does, is it safe to the chip? Tfb, this parameter can not be controlled manually, what happened if the blow time is longer than 1ms. once it is been blown, doesn't matter how long the voltage applied to the pin any more, as no current flow through the pin any more. am I right? No, you can't blow JTAG fuse on MSP430x2xx devices with just applying 6-7 V to TEST pin. 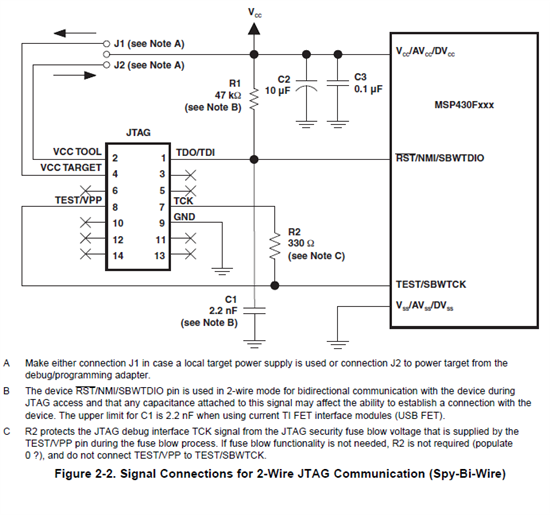 There is JTAG / SBW entry sequence that must be executed before applying 6-7 V to TEST pin. Check BlowFuse function in JTAGfunc430.c from slau320. It is possible to add this option on MSP430F5529 LP by modifying open source firmware and adding some extra hardware on board (check slau320 schematic). thank you very much for your prompt response, I understand I need a JTAG tool to do the fuse blown. If I use a FET pro430 to do this job on my Launchpad, could you please help me review the following procedure. left of the drawing if from LaunchPad schematic.